Mearhbarrow was first founded in 1902 when it started out as a racing stable for thoroughbreds.The facilities were closed during the Second World War and reopened as a private stable in 1947, its services expanding into a riding school in 1957. The school was then purchased by Mark Boone in 1983 who started taking the centre's focus back towards competing. In 1990s half of the ownership moved to Maura Broughton, and the other half was later inherited by Boone's godson Isaiah Pace. 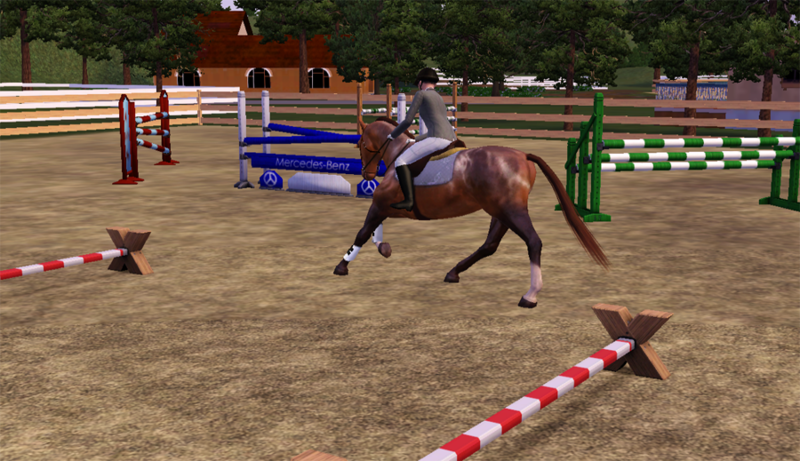 Today the facility focuses on breeding fine Warmbloods for show jumping and eventing, and Andalusians for dressage with the occasional coldblood trotter or an Akhal Teke racer to honour the stables' history as a racing stable. Currently we have two large stables, three training fields and several large pastures for our horses, as well as a foaling shed. There's also a cross-country course nearby and several long bridleways cross the fields and woodlands. 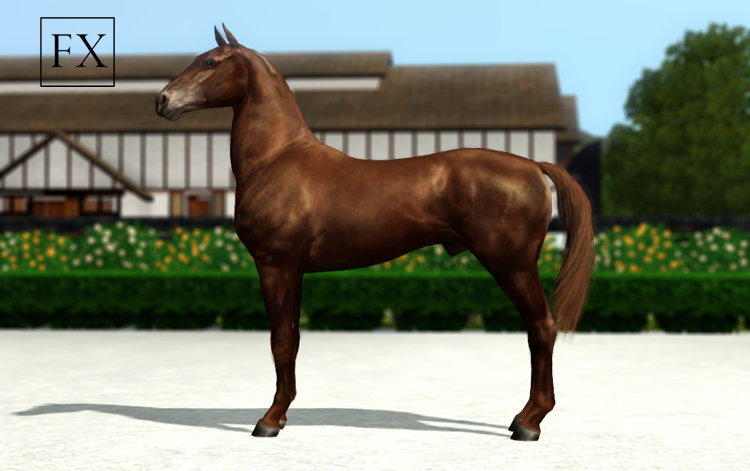 I won this fantastic liver chestnut Akhal Teke stallion at a raffle hosted by Maize Winters few months ago on another forum. He's an import, and that caused us some trouble when it turned out that his papers had been lost in the mail. Suddenly, we had an unregistered, and seemingly unnamed horse in our hands! Luckily we were able to sort things out with relatively little hassle, and the exotic boy here, named Pharaohh (possibly due to his character) will have his registration pending soon enough, and you'll be seeing him in the show ring in no time! 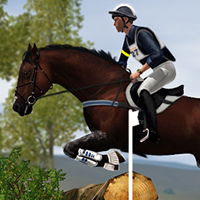 His final discipline is still open, so in order to determine if he's more dressage, jumping or full-on eventing prospect we are trying him out in eventing at first like with our other Tekes. Pictured here in front of our brand new facilities in Wales! 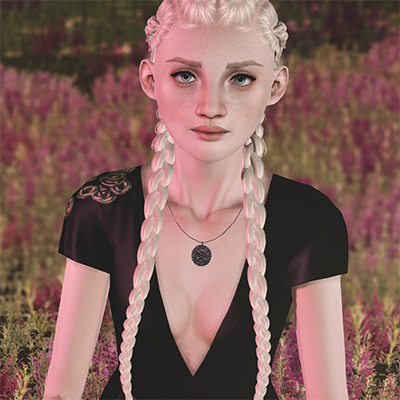 While the blog is still something of a WIP, comments are allowed, even encouraged! The Christmas before last we were pleasantly surprised by Dorian Clay who so kindly gave us a new chestnut Andalusian colt with a wonky blaze and socks as a Christmas present. This strong two-year-old horse was born in Spain and is the offspring of our very own Golden Boy, Dorado, and was named Nebuchadbezzar after the fourth king of Babylon. He certainly seems to think himself the king of the hill! 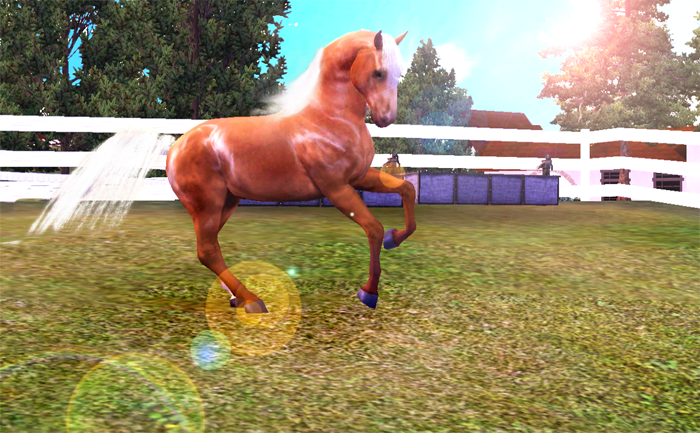 Last Christmas Elaine Rose surprised us with a...chestnut Andalusian colt with a wonky blaze and socks! Jaws dropped more than once when Cristallo HX was unloaded from the trailer, and I wasn't the only one who got a sudden feeling of déjà vu - it hasn't been too long since we got another set of unexpected "twins" when MBS Anatoile and Oh, Lady Dahl T were first seen side by side. Call it Christmas miracle! 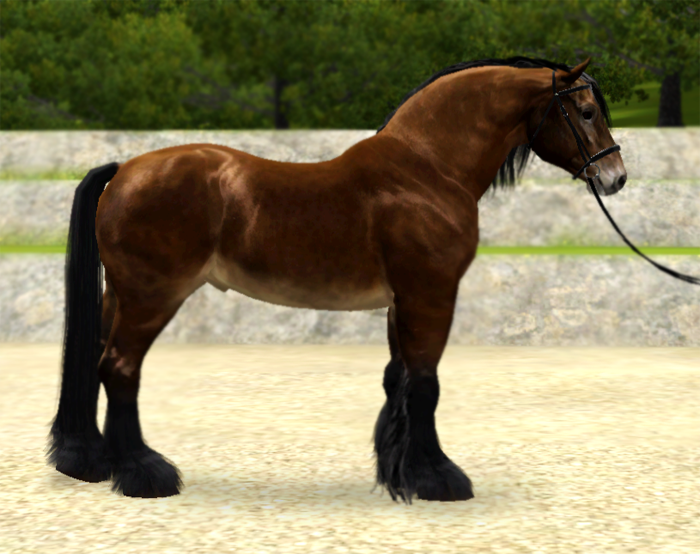 Our dressage team is largely dominated by Spanish wonders these days, and even more so once Cristallo's registered. Stay tuned for more updates! They are Spanish wonders indeed! Btw I love your presentation with the photos and all! I remember the raffle you got Pharaohh from, they were all so handsome but you definitely got a stunner there! @Petra-Wyngaard Thank you! 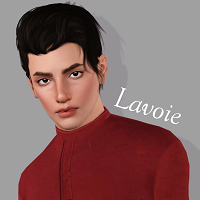 I wish I could post more about the boys but the Grey Horse Valley world has been nerve-wreckingly laggy lately and it takes a lot out of the fun. Maybe I'll do that once Cristallo's been registered. @Callixta-Rosella I definitely did! It was so hard trying to decide which one to apply for, but there was something about Pharaohh that speaks to me. If my memory serves me right he's the third horse I've won in a raffle, the other two being MBS/R Oceanborn and Dumbo Flies GHA, and I've bee very happy with them all. 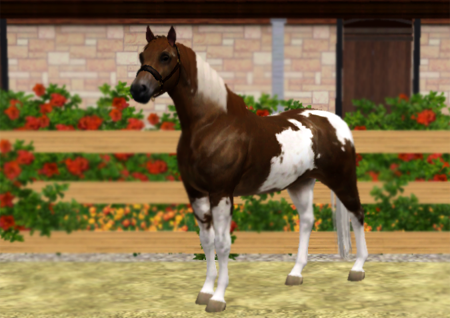 Bay-B is a bay British WB mare with minimal tobiano markings out of MBS Daisy May (British WB) by MBS Ricasso (Dutch WB). 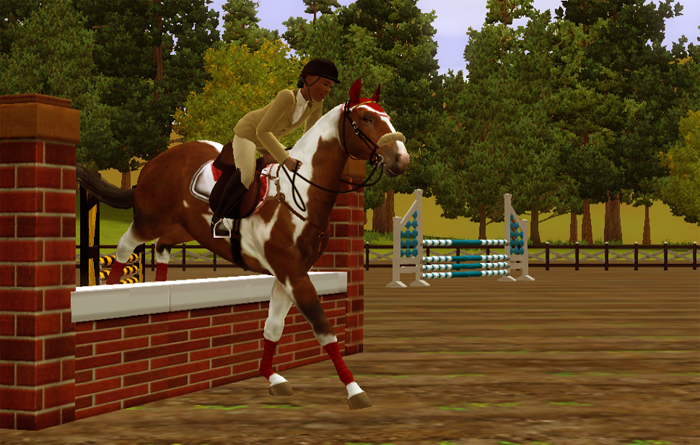 She receives a +3 bonus in show hunting and +2 in eventing, and debuts in the Morgan Park Horse Trials. Pictured here with Dani who usually rides the ponies but borrows her from time to time. A late afternoon hack took the pair to the cross-country course, and with the trials coming up they decided to try a couple of jumps. Dreamweaver is a striking International Sport Horse by MBS Gülbahar (Akhal Teke) out of Diamantes de la Reina (PRE). So far she receives a +2 bonus in dressage and +1 in eventing, but her sire also gives a +2 flat racing bonus. We were originally planning on starting Gülbahar and the rest of our Tekes in Eventing already, but they've all done so well on racetracks that we have postponed that plan. Dreamy has already won us all over with her sweet, sociable character. Whenever the water buckets are filled or lost horseshoes being searched, she follows people around like a big dog, apparently believing that she's helping. More often than not, she isn't. So far six buckets, two riding crops and one glove have been lost after she's decided that they're obviously meant to be her playthings. A Spanish Sport Horse filly by MBS Dorado (PRE) out of MBS Daisy May (British WB). She receives a +3 bonus in both dressage and show hunting. It's still unclear whether we'll ultimately keep her, lease or sell her now that we are moving away from show hunting in favour of our jumpers team, but time will tell. She has a good conformation she's inherited from her dam, and her light golden coat makes her a real beauty and gives her some extra breeding value in the future. At the moment she is, however, too young for her training to start and so all her days are spent learning how to be a horse in the small herd consisting of her, Bay-B, Dreamweaver, FX Diamante en Bruto and our ponies. I've been telling myself and everyone for ages now that I need a Finnhorse but neot once have I managed to get one for myself. This cannot abide! May I introduce Tuhlaajapoika FX ("Prodigal Son") who's to join our Welsh team, though his discipline is still undecided. 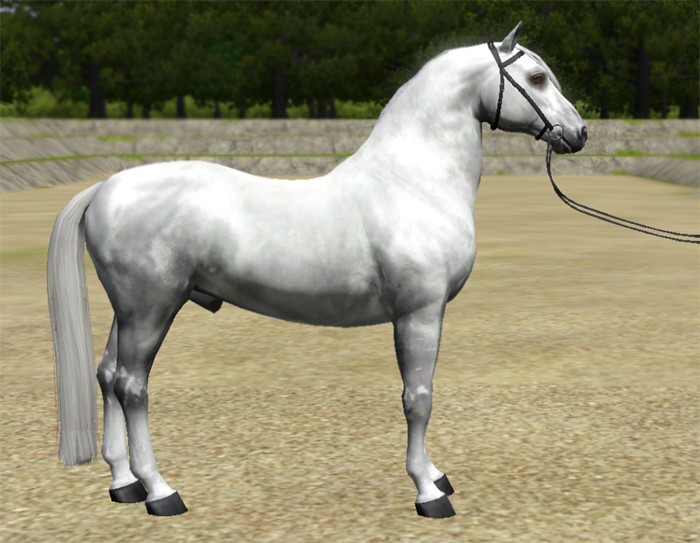 He's a 3-year-old silver dapple bay stallion, born and raised in Southern Finland. More (and better) pictures coming soon. Tuhlaajapoika is based on a RL Finnhorse of the same name. I know his breeder (I actually learned to ride on a Shetland pony mare she owned!) and remember being a bit afraid of him when I was a kid and he was this big, unpredictable stallion I wasn't allowed to approach. These days he's a 25-year-old gelding (we were both born in 1992, perhaps that's one reason why I remember him so well), and instead of silver bay he's actually a chestnut. I almost forgot - Mearhbarrow has a new website! The old one I coded myself by using Webs (the account I'd created several years back when the site still allowed the HTML option instead of the WYSIWYG method that's now everywhere) but it has lately stopped working (security checks that keep crashing, I'm constantly being logged out, and their customer service is only reserved for those who pay for it) and so I switched over to Wix. Each horse now has its own profile page that's no longer embedded in an iframe. If you have a horse from us, please update their links! Thank you! What a gorgeous Finnhorse, I must admit I'm in awe of how many letters are in his name! He's so handsome though! @Callixta-Rosella Thank you! Tuhlari's name is somewhat on the longer side, Finnhorse naming rules state that the horse's name should be maximum of 18 characters (spaces included) and in max four parts. As a matter of fact I think Nebuchadnezzar's name is even longer : D Though Tuhlari does win on the number of letter As. It also says in the rules that the name should be "easily pronounceable". Now that one may just depend on who you're talking to! PS. Where is that gorgeous curly mane from? In my opinion, a Finnhorse that's not 70% mane is not a proper Finnhorse at all. Gimme that hair! The mane is a crimped double mane by Sugar's Legacy Stables. It's been two years since I joined Equus. 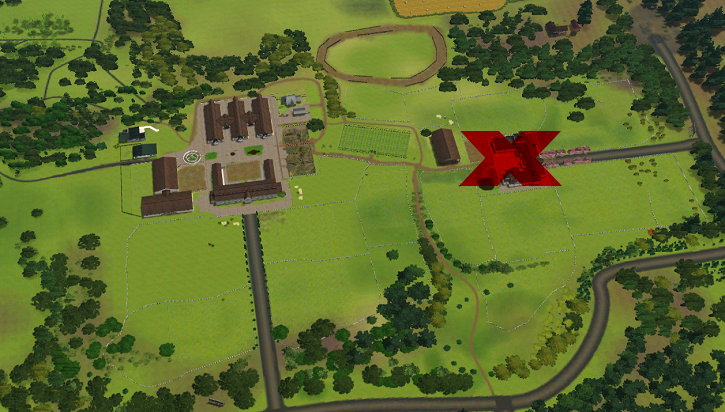 A lot has happened during that time, many a plan has been changed or scratched completely, and I've got to watch my facilities turn from a small family farm to a gigantic estate, and see sims and horses grow and develop. It often makes me a bit nostalgic when they do well in a show and have gone from newly created foundations to champions reaching for the leaderboard top-10, or whenever a new foal is born and I'm reminded of the day my horses were just old enough to start competing themselves and I had no idea what I was doing. 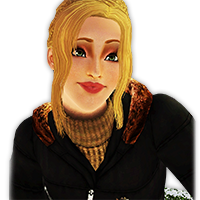 I'm taking this update to looking back at how far we've come and speculate what's still waiting for us right around the corner. This is a big update. Be warned. 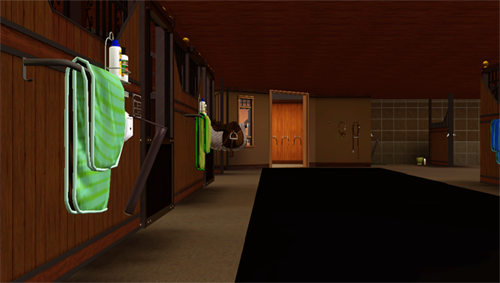 At first the main facilities consisted only of two small stables on one single lot. 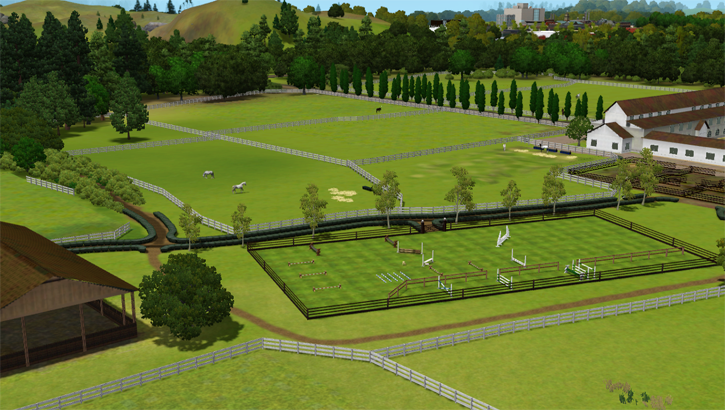 The plan changed while I was waiting to be approved on ES and I created bigger facilities in a new world (sadly I don't have a picture of these) before creating Grey Horse Valley 1.0, 1.5 and the current 2.0. 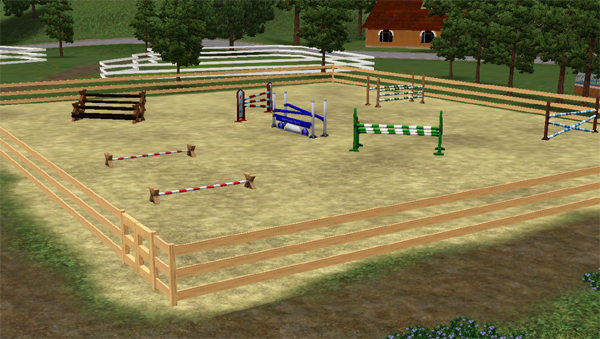 We went from ~8 stalls to a multi-lot equestrian centre with a sister centre and ~40 horses surprisingly fast. And my original plan had been sticking to just the few! 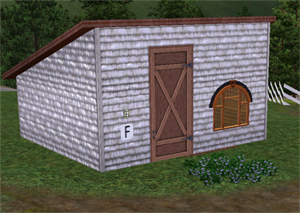 The third stable, originally intended for stallions, no longer exists. In the early days we also only had one arena as opposed to the 3 outdoor arenas and two indoor arenas we have now. Gosh, the image quality is terrible. Picture on the right showing our largest turf arena and a bit of the covered arena. 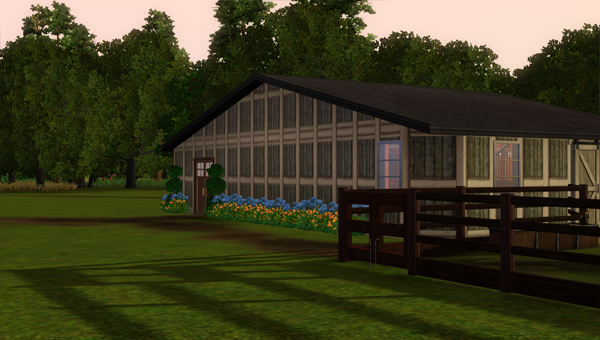 Our very first foaling shed! Sadly due to technical issues I'm not able to take a picture of the one we have now, but on the right is the shed 1.5 that resembles the one we have now. Here's our main stable 1.5 and 2.0. Not much has changed, the box stalls have been redesigned, the walls have a new layer of wood and the ceiling are now supported with rafters. The space used to be open at first, but we needed somewhere to put all the hay our horses eat. 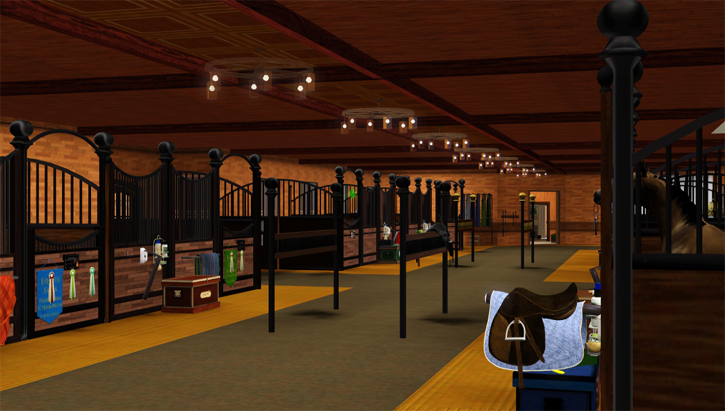 Nowadays there are also grooming stalls in the middle of the wide aisle. That's right, folks - Atlas was meant to be a skewbald at first! But then I got Attila and Chardonnay and I figured that three tobianos is too much for a beginner (especially with all the rare colour limitations there was at the time). I also stumbled across a photo of a gorgeous blood bay, and that was Atlas' new me. 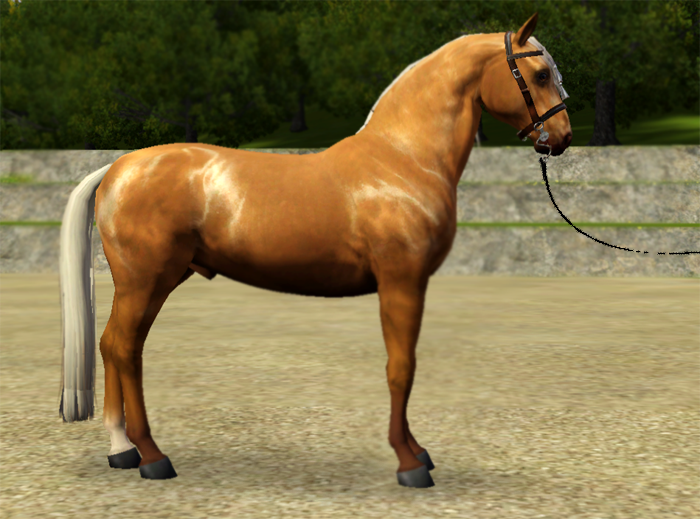 If my memory serves me right he was the first horse I got for ES, the others being Attila, Chardonnay, Dorado, Flying Dutchman, Skyfarer, Håbrand, Valkyria and Equador. Flying Dutchman was meant to be a Standardbred harness racer (just look at that dreadful conformation! God! 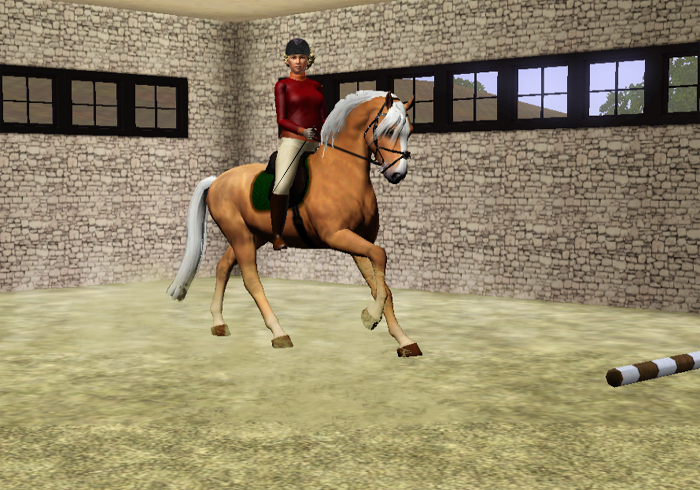 ), but for some reason I changed her into an American WB instead and she eventually became a Dressage State Champion and a Regional Champion in carriage driving, you go, girl! Equador was one of the first horses we registered, and has matured exceptionally well if you ask me. 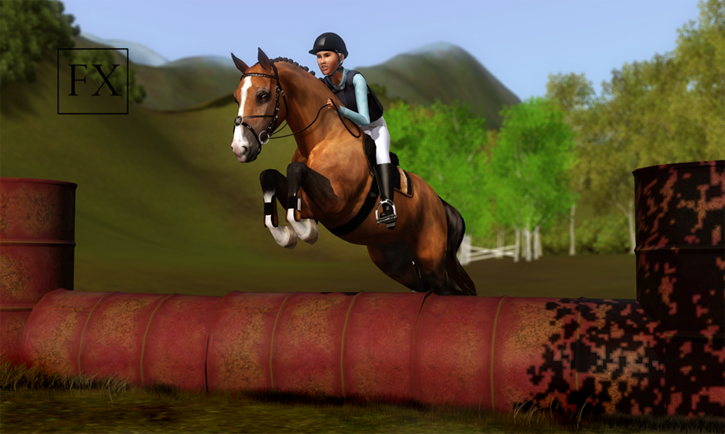 He was meant to be a dressage horse but since nothing came out of it I sold him off to try his luck in Working Equitation, only to recently reclaim him. 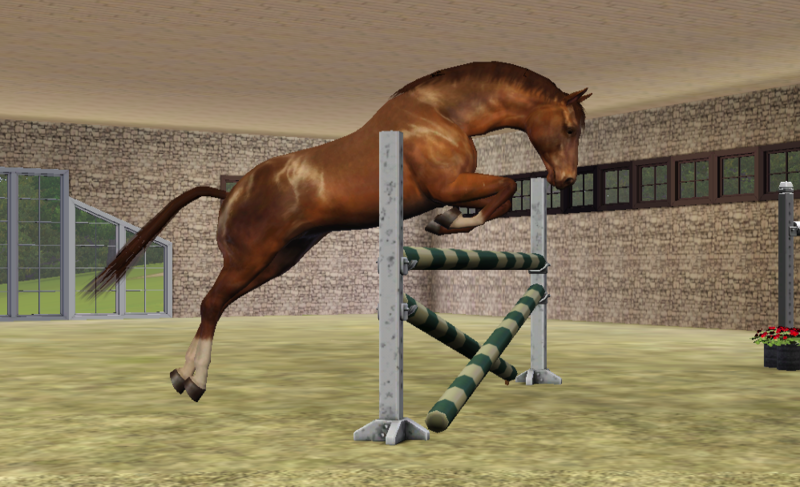 Nowadays he's part of our show jumping team, and it's starting to seem like we finally nailed his discipline! I really had a thing for dreadful conformations two years ago. Not much has changed about Dorado, aside from the fact that nowadays he at least looks like a horse. 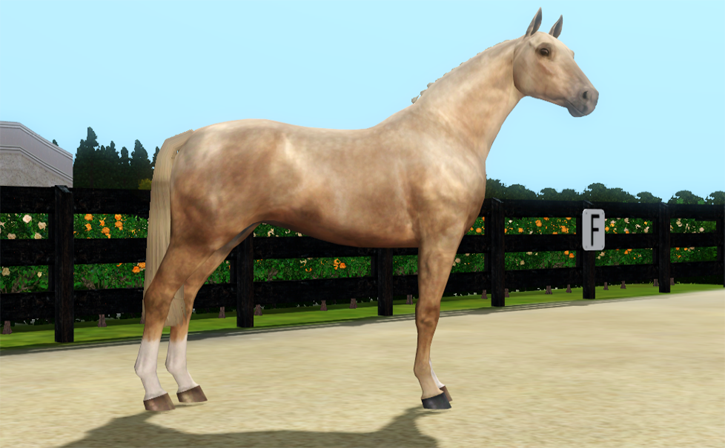 I'm still not perfectly happy with how he turned out, but not every horse is perfect. Now here's something you people don't know - Ricasso was originally named Gainsborough (seriously, what was I thinking? Was Winsborough already taken?). He was also the "foundation I never wanted" because I wasn't planning on registering his dam Chardonnay. 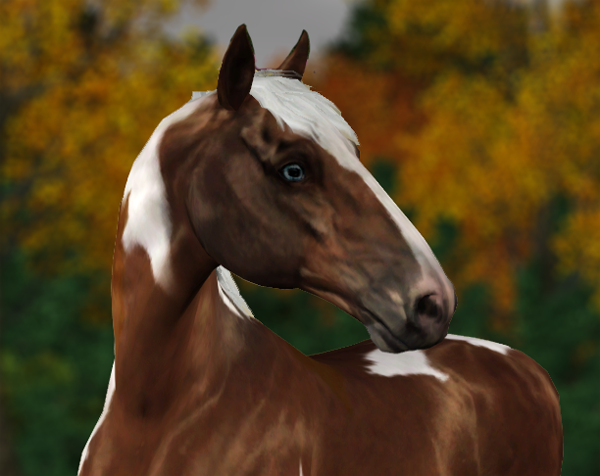 He was yet another of the surprise foals that kept on appearing when I played the game in the story mode (I had to disable that since I ended up liking the foals too much). He had one blue eye at first but that one had to be changed since he doesn't carry splash. 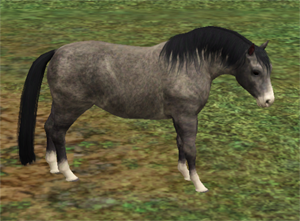 Daisy was the first of my "accidental foals", and even better - she was a twin! Sadly her brother passed away soon after birth, but she made it into adulthood. She, too, was a bit wonky-looking at first but as she matured she turned out a real beauty after all! "Tuhlari" was meant to join our team a long time ago, although back then he was a flaxen chestnut named Talventakoja ("Wintersmith"). 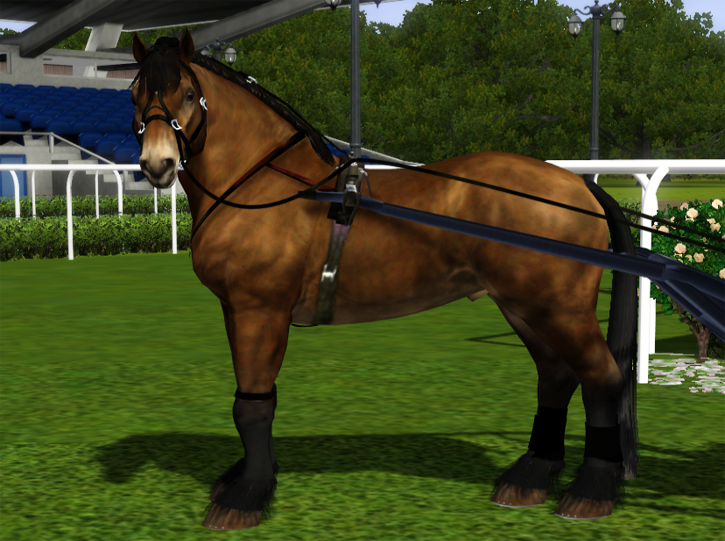 However, for some reason I decided that the time wasn't right for a Finnhorse just yet. This is Luca, a Shetland pony gelding older than the sky itself who was meant to be the mascot of our stables and to calm the nerves of our show horses. We kept him as a lawn ornament for a while (version 1.0) before giving him away when we moved, mostly because there was really no point to him. 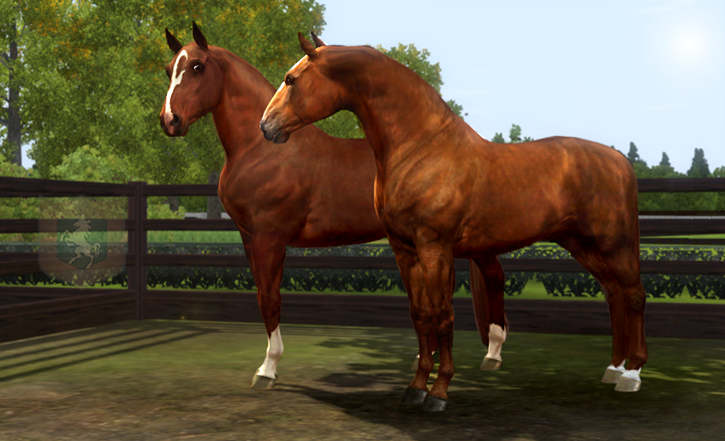 These are the Arabians Sultan Al-Sharq (black) and Laheeb (chestnut). 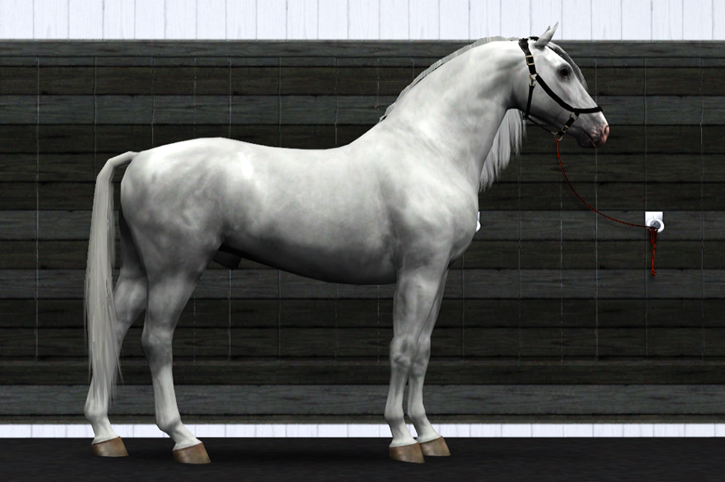 I have no idea why I got them in the first place, I've never been that into Arabians but for some reason I thought they'd make good Endurance horses. Maybe they did - I sold them in-game not soon after, they just didn't do it for me. 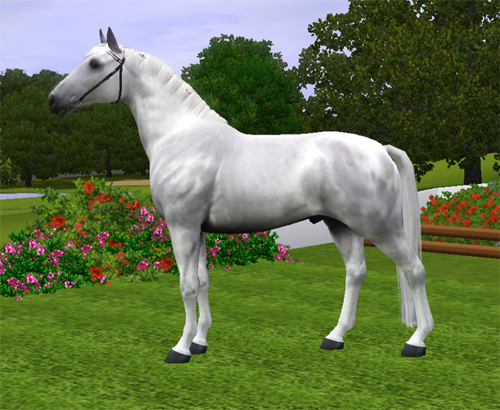 Quiescent was a grey PRE mare I originally got as a broodmare, but ended up selling her later. 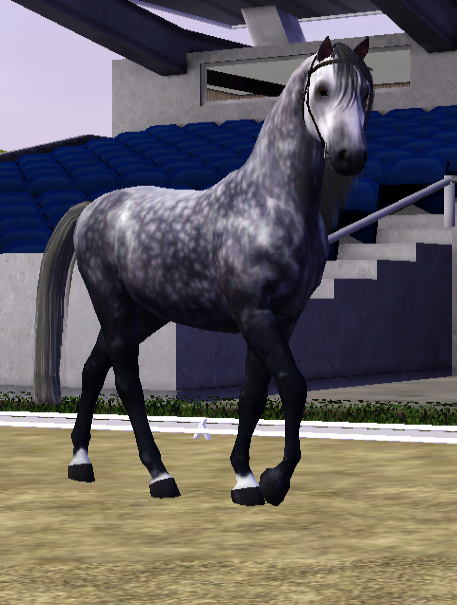 Soshone, nowadays named MBS Bell of the Ball, is a black varnish roan Appaloosa mare who was to become Millie Grey's Western horse, but when I gave up on the idea of opening a Western section I ended up selling her to Lindsey Warren who gave her coat a stunning update. Nowadays Millie is into Eventing and has done very well with her horses Oh, Lady Dahl T, ES Rodheatte and MBS Carmina. MBS Frisky Triumph was a Standardbred meant to be used for harness racing, but the idea was scratched was some reason and I only ended up keeping Håbrand, although I have no idea why. Perhaps I just felt that the facilities were lacking colder blood, who knows. 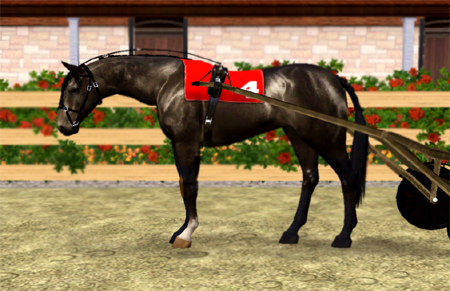 Nowadays our only harness racers are Håbrand and his offspring MBS Rövardottern, both Swedish Coldblood trotters. 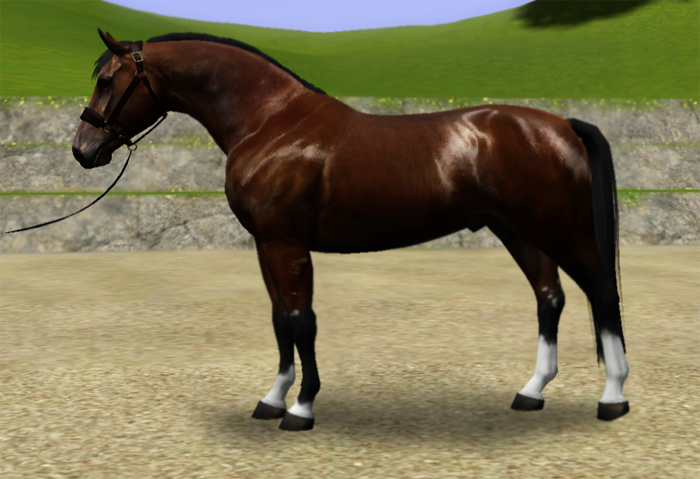 MBS Will if I Want aka Wilson was an Oldenburg gelding and one of the first I decided to sell on ES (but ended up selling him in-game due to no interest (which incidentally was also to become the reason I had to cancel most future sales)). I don't know why I didn't keep him, I'm not at all disappointed in how he looks. I suppose I simply had too many foundations at the time. Maybe he'll be reincarnated someday! 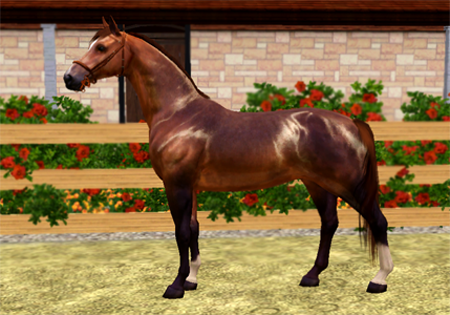 This is Cannonball, a British WB mare and MBS Daisy May's doppelganger. Their similar looks was probably the reason I ended up leaving her behind when we moved from the farm to Grey Horse Valley. One of the first pictures of all the mares we had back then. From left to right, Frisky Triumph, MBS Gjestar few weeks since birth (he's for sale, by the way! ), Soshone, Flying Dutchman (front), Valkyria and Daisy May. MBS Valkyria and MBS Gjestar. One of the first edits of MBS Dorado! MBS Daisy May (left) and her unnamed brother. 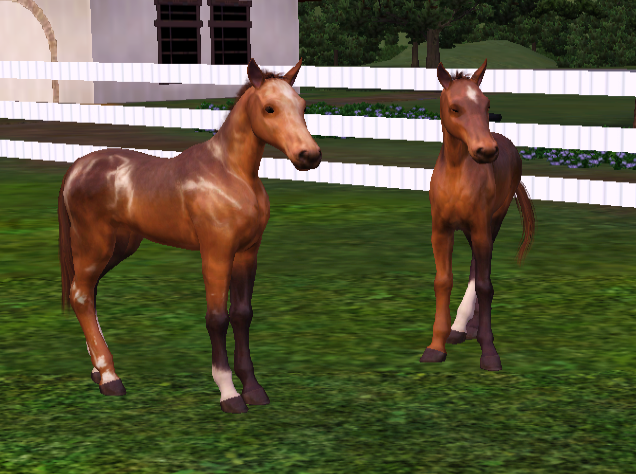 Back then I didn't tweak my foals at all, and it shows. 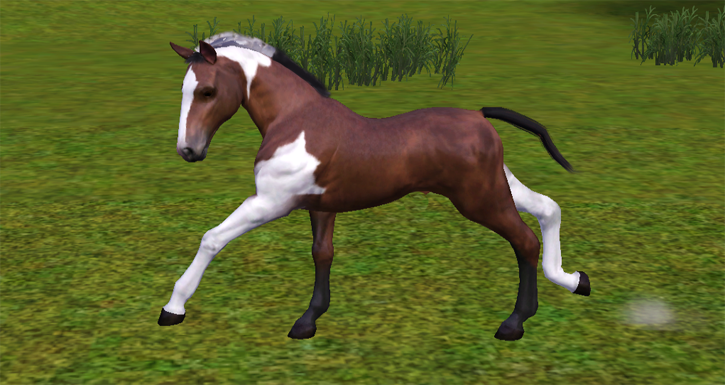 These days I pay more attention to the conformation of the parents which leads automatically to better looking foals (even with the Sims genetics). 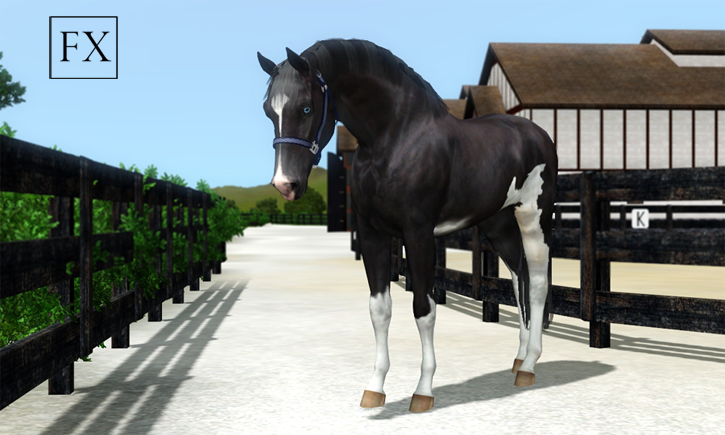 Dorado, pictured in front of the stable 1.0. Tuisku and Chardonnay's first local SJ show before she was registered on ES and became a Show Hunter (and, nowadays, also a jumper). An ancient training picture from the first farm. 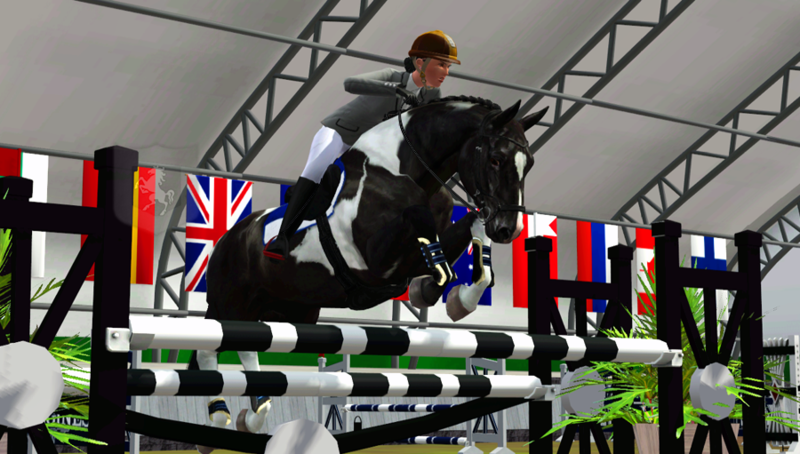 MBS Equador in the arena of the stable 1.5. 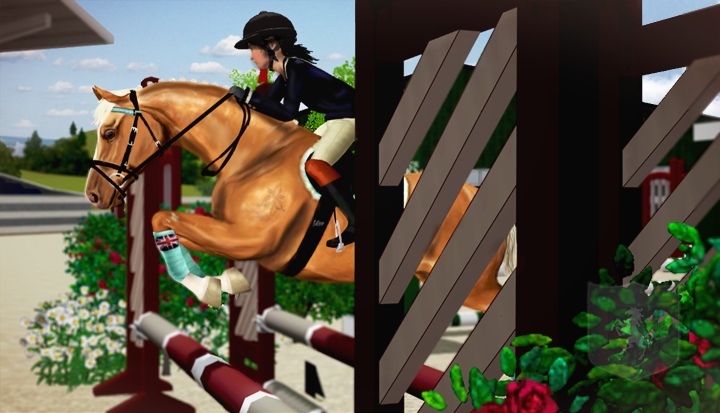 The picture on the left is Attila's first ever T-show entry from Sunset Valley GP 2015 (4th place), and the on the right is from Texas Rose Horse Trials 2016 (5th), both are non-edited. Attila's jumping quite a bit higher these days, and even Devon has a bit better form. 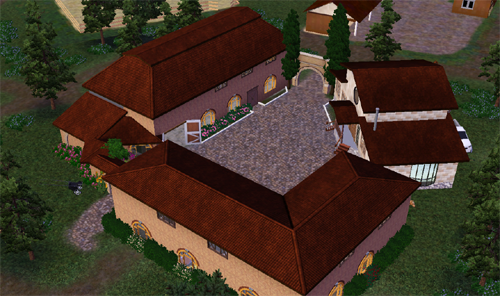 Here in-between they also entered the Roaring Heights International show and placed 6th. We've been told that navy blue is not Attila's colour (which is blatantly false, by the way. Navy blue brings out his eyes). 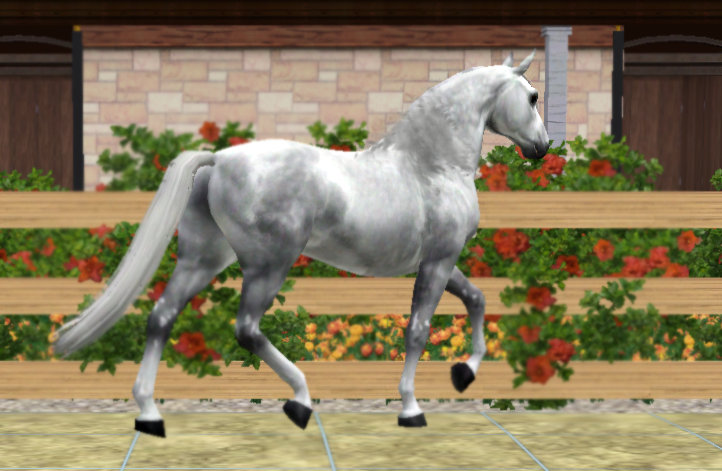 The comparison here isn't that fair because we have two different ponies here, and it's not like I haven't entered TLM Sky's The Limit (left) to other edited T-shows as well (I did - and they've even won!). 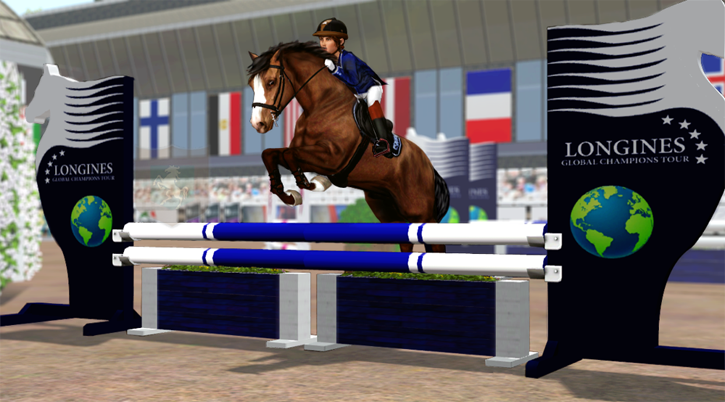 However, here I wanted to show the edited pony show jumping T-show entry I like the least versus the one I like the best (on the right). The one on the left is from YRC Halloween Fair 2015 where I first tried some a bit heavier editing on the horse (and failed miserably), but somehow Jillian and Sky ended up taking the second place. The one on the right is from Vilhelmsborg European Pony Trials featuring Jillian and Dumbo Flies GHA, placing 2nd this time as well. This is if not the first then among the first five edited T-show entries I ever did. On the right in comparison is MBS Dorado's last T-show entry. 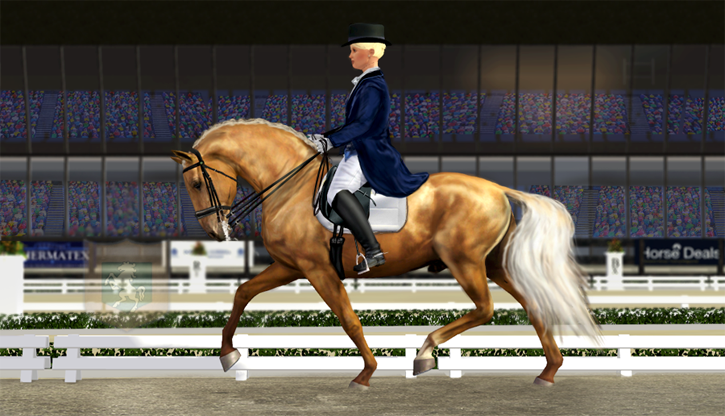 I think the one on the left is from Cecil Dressage Showcase where we placed 7th. The other one's from Deodoro Dressage Festival - where we also placed 7th! Truly some things never change. The future still hold many more adventures for us, both good and less great. There are new foals to be born and raised, shows to be won and lost, titles to be gained, and most importantly memories to be made. Thank you for riding with us these two years! I'd also like to thank all of you who have bought a horse from us or who have an offspring from one of our horses in your stable at the moment, I hope you'll continue having great time with them. Also, sorry again for the monster update! @Lidija-Rotherford Thank you! I just wish I remembered enough to write something a bit more coherent than the occasional comment of each picture, but like most people I tend to like to pretend that I never started but instead was born with the skills and plans I have now and so I didn't really save anything from the early days. And you're not alone - I sometimes miss the old pons, too! Wow, this was such a nice idea! I should definitely go through my old photos (and by old I mean pics that I took way before I started to publish stuff) and make something similar some day!